Today a friend of ours who lives on the next street over invited me and Bridgette to join her kids at the Highland splash park. The Bridgenator had a grand time. In our everquest for Bridgette to catch up to her peers, we're still working on mobility, and we've seen some incredible advancements this week. For fear of being hurt (who can blame her, she's endured a lot of physical pain since the hour of her birth), Bridgette prefers to be quite confident that her safety is ensured before attempting anything. So she's been a hesitant little button most of her life. She's considerably more willing to try variations on ambulation if I am present... and possibly holding her in some fashion. She takes her sweet time gaining confidence. Then, once she's assured, she's off and independent and rarely looks back. This week I have seen 3 brand-new developmental gains! And I really can't explain, no matter how hard I want to convey it, how excited I become every time I see her do something new or even "dangerous"---things kids and moms around me seem to take for granted. I'm ecstatic every time she tries! But to others who have watched her life, to those who can compare the last two months to the last two years, it's another perspective completely. Especially to me, inside the day-to-day-to-day of every day, I'd say she's a speed-demon of development right now. Every time she succeeds at the tiniest new thing, I'm awash in giddiness. I suppose, like any anticipation, wanting something for a long time can make the receiving of it sweeter. And I guess what I want for her has little to do with her actual locomotion and everything to do with her confidence and happiness and increased life-opportunities. Gone are the days when she'd smash her head on purpose, repeatedly, as hard as she could against the floor, the wall, or furniture--an expression of her frustration. She no longer punches herself in the face with her fists, angry that she can't move. She's still frustrated at her lack of speech, but her non-verbal communication has improved by degrees right along with the number of words she attempts to say... so we're managing in that realm too. Sometimes we both have to take a deep breath and recognize that the other is trying (her = to speak; me = to comprehend), and revel in small speech victories too. Step 2: The two-footed jump from one surface to another! This fan-super-tastic development was first witnessed by me and Jeff on Monday night as she bounced around BYU campus with her cousins. She practiced it for hours off a low step at the Orem Public Library on Tuesday morning. And she finally got to show it off today at the splash park into (drum role please!) MOVING WATER! Step 3: Well, blow me down! The girl can climb! Even if she can't get down . . . 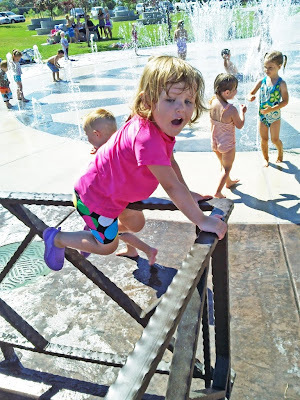 So, Bridgette saw some kids sitting on this railing, and in a trice she was up and over! No help from me, I guarantee it! She's never climbed anything like this before, and I was shocked, I tell you. Shocked! At the top she swung her leg over the rail like she was mounting a horse. But, railings being uncomfortable without a leather saddle, she didn't want to sit there for long. Three fabulous developments from this week! Just for fun, here are two more videos. The first shows Bridgette playing, fairly unaware that I was in existence. One thing I love about this video is how often she throws her arms up above/over her face, her special move to block the splashes from the kids running around her. She's the one with the big yellow ball in the video, and she almost loses the ball several times because she pauses for her ninja block. If you've got a little patience, here's the second video. I took this a few minutes ago while I was still mid-blog. It began raining, and I was summoned to see a beautiful rainbow that stretched so nicely it looked as though both ends were landing in our yard. I'm including it so you can hear a sampling of our current speech challenges... both with her pronunciation and my perception. As I was transferring the video to YouTube, I realized that Bridgette was saying, "Popcorn!" when she first saw the hail. It makes sense now, but it obviously took me a while to catch on. "Wha-hey!" = "What's that?" and/or "Why?" "See-hey!" = "Look there! See what I'm seeing!" "Hi. I me." = "Hi. I'm whatever I'm pretending to be... and really, that could be anything and you'd better guess right." It won't be long and she'll figure out that she can climb out of her crib. That will open up a whole new realm of adventure. Congratulations, Bri, on the advancements!!! While the language may still be a challenge, it *is* coming along. Interesting - the word verification for this comment is "bablen." I wonder to whom it might be referring. It wouldn't be me, would it? P.S. - again - let me "bablen" some more. Two things - I love the popcorn analogy (that girl is a creative thinker; I do believe I will be calling *hail* popcorn henceforth) - and - now that she's accomplished the two footed jump she can work some more on that hopscotch thing (I anxiously await more video)! Congratulations on the new advancements. Very exciting! The little boy in the white tee shirt was so sweet to help with the ball. Is he one of the neighbors or did he just decide to be helpful? @Lynn: The little boy was a stranger to us, but he was very kind. I wondered if Bridgette would toss the ball back to him, but instead she threw it the opposite direction. So she didn't really reciprocate his cooperation. @Mom: I liked the popcorn analogy too. She's quite creative and imaginative. I have no doubt there's a lot of fabulous neural connections in that brain of hers. As to hopscotch, that may be a ways off still, as that would require one-footed jumping. 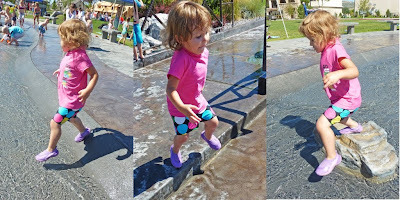 She's been able to jump two-footed from a standing position for a while now, just not from a higher to a lower surface. When we "dance," she practices standing on one foot, but it's split second only. Still... she never used to try, so like all else, it will come. James loves to watch Bridgette, he is always enthralled, but today he says Yeah! (or in his case AAAAAY! )repeatedly and claps. He is very excited to watch what she can do. Great post, Thanks Kel! I love being able to be a small part of these exciting times!